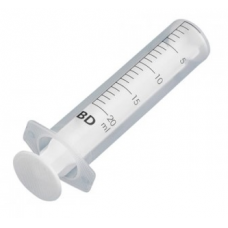 Syringe, sterile, disposable, two piece, polypropylene (PP), 20ml capacity, latex free, sterilised by ethylene oxide (EO), CE 0318 marked, natural (clear) polypropylene (PP) barrel with black print graduated scale in 1ml divisions, white (opaque) polyethylene (PE) piston / plunger, with retaining ring to prevent accidental piston / plunger rod withdrawl, luer slip nozzle, eccentric tip, without needle, natural, translucent, pack of 100, individually wrapped in blister film and medical grade paper, Becton Dickinson, BD Discardit II, 20ml Luer, 300296. LabShop supplies the complete BD Discardit II product portfolio. If you cannot find the specific BD Discardit II item(s) you require within the LabShop web catalogue range, please contact us for price and availability.